Calf on the Lam: Book Traces the Adventures of a Wandering Week-Old Steer | Bookworms | Kids VT - small people, big ideas! In September of 2017, a runaway steer in Woodstock had townspeople on the hunt. The week-old American Milking Devon, Huck, and his brother Finn had just been purchased by Billings Farm & Museum, a historic working and educational farm. On delivery day, Huck headed for the hills. He ran through the fields, down River Street, and even wandered up nearby Mount Tom. The next morning, when he was given up for lost, the farm manager found him back at the farm. The little explorer had crawled through the rails of a fence and joined the other calves in the pasture. Billings Farm was started in 1871 by Frederick Billings, a lawyer, railroad builder and pioneer in scientific farm management and reforestation. Now owned and operated by The Woodstock Foundation, the Billings Farm & Museum was founded in 1983 to preserve the historic property. In addition to a restored farmhouse and creamery, the farm is home to sheep, draft horses, chickens, Jersey cows and oxen. The Devons were a prized addition. This once-common breed played a significant role in Vermont history as valuable draft animals, hauling timber and clearing fields — and even earned a place on the state flag. Currently, Huck and Finn are training to wear a yoke and pull loads as demonstration animals. Until they're ready to perform, visitors can see them in the barn or outside in the paddock. When illustrator and writer Kristina Rodanas — also a part-time educator at Billings — first read about Huck's journey, she thought, Somebody has to write about this. "It was just too good a story to pass up," she said. Her picture book, Huck's Way Home, is Billings' first children's book. From her Woodstock studio, Rodanas spoke with Kids VT. Kids VT: What inspired you to write this story? 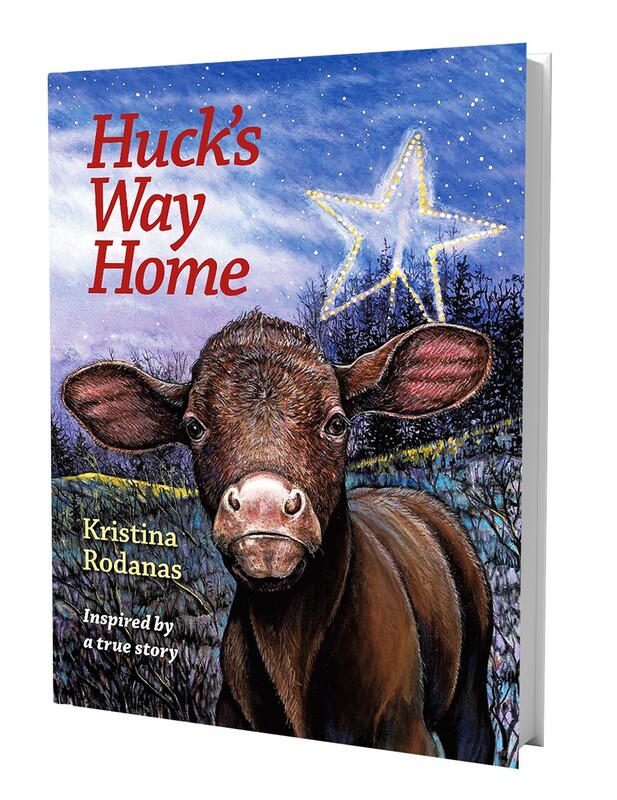 Kristina Rodanas: When I read about a lost calf in the newspaper, I thought, Huh, I bet I know where he came from ... That was the basis for Huck's Way Home ... I started interviewing people. As it turns out, there were a number of people working on the farm that afternoon he took off, so a number of people chased after him. There were visitors when he escaped. They saw him running up through the back of the property and out onto the street. People who worked there chased after him. The police went after him — they really did ... [and] the farm manager and his family. They were chasing him through the afternoon and up onto the trails along Mount Tom. KVT: Is there a deeper theme of your book? KR: This amazing story is all about a message I've really wanted to convey: You have it within you to find a way to solve your problems ... Huck perked up his ears, listened and remembered [to find his way home]. That's a message to listen to your elders. They sometimes know what they're talking about ... Most of the books I've done have something to do with being self-reliant and finding your way through some kind of a crisis. KVT: Can families repeat Huck's journey? KR: We've included a map [in the book] that is really cool, so families can follow Huck's travels. He was spotted by hikers at the star [at the top of Mount Tom]. He was seen in two cemeteries ... He was kind of like Where's Waldo. KVT: Tell us a little about your next children's book with Billings. KR: The book will be called Bristly Baby Berkshire Pigs: A Billings Farm Alphabet. It will not be the usual alphabet book. No A is for apple here ... There will be something special about Billings Farm for each letter of the alphabet, such as: A is for Araucana's aqua eggs, S is for shearing Southdown sheep and T is for tapping the trees. It should be available for sale later this year. Meet Kristina Rodanas and Huck at Billings Farm & Museum's Baby Farm Animal Celebration, Friday, April 19, and Saturday, April 20. Find more information at billingsfarm.org.